KISS 1979: Water, Fire, Wind and Wacko. 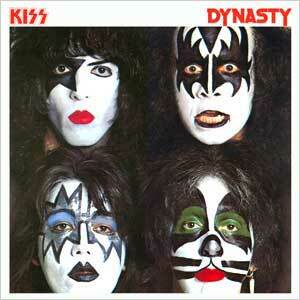 Dynasty was billed as The Return of KISS. 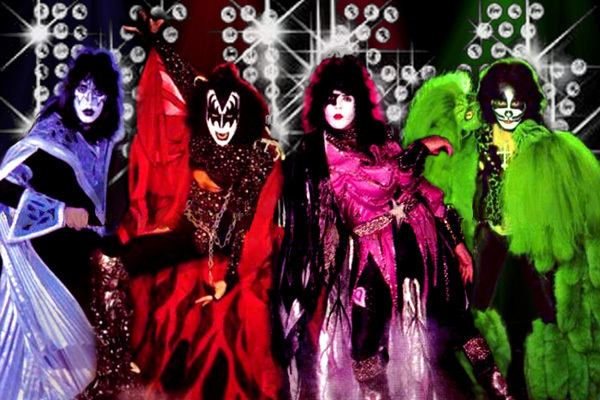 It was their first studio album as a group after the four KISS Solo Albums. And after the hard rock havoc each member strutted individually in their Solo projects (except for Peter), Dynasty was a shock to the senses, as we find KISS bringing their own brand of dance fever to the disco milieu. THIS? After the horror-movie highway of Gene’s Radioactive, Paul’s punchy Tonight You Belong To Me, Ace’s explosive Rip It Out, and Peter’s… well, uh, yeh, whatever… Produced by Vini Poncia, here was the precursor to the mid-80s smoothie guitar sound popularized by Def Leppard, though not nearly as aurally pleasing. 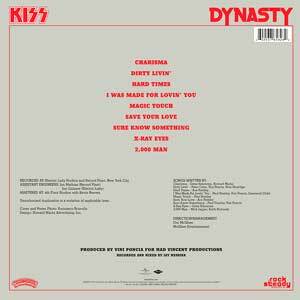 There are only a few songs on Dynasty that bite; all the rest are notable for their construction and unique production, but are throwaways as KISS songs. And Dynasty is where the KISS album numbering starts to get iffy. For example, it was technically the 7th album, but it was the 10th release if you count live and compilation albums, and it was the 14th if you count all four Solo Albums under the KISS aegis. But enough about numerology. Was the album any good? If you owned a dance belt, yes. Paul Stanley’s I Was Made For Lovin’ You, the album’s worldwide hit single, was his first collaboration in what would become a decade-long writing partnership, with songwriter extraordinaire Desmond Child. It’s unapologetically disco-oriented, with a galloping beat and heavy guitars. And everybody loves it, including me. Because it’s a unique experiment that works. It’s the other songs that are all trying to be something they’re not, that trip the album up. In other words, excepting I Was Made For Lovin’ You and 2,000 Man, all KISS’s riffs have been shaven down to sound like >>this<< when they should sound like <<THIS>>. 2,000 Man. Gifted a song by Jagger and Richards, Ace Frehley puts his Jendell stamp on this kicker about a future citizen “…growin’ funny flowers outside on my little window sill…”, where we feel the smoke billowing from his guitar during the chunky intro. His voice doctored to sound like he’s singing in tune, it’s a Frehley classic and the best song on the album. But listen to the guitars. Are you listening? Because you won’t hear them this tough ever again on the rest of this album. Sure Know Something is the second single and Stanley’s wistful ode to being statutorily raped, “I was 17, you were just a dream…” “You showed me things they never taught me at school…” Catchy, pseudo-heavy, with a Mr. Stanley lead solo! If KISS were going The Way of the Fever, then this song is an indication of how interesting that direction could have been, with its walking bass line and reggae guitars during the verses, then pushing into the contrast of the driving rock choruses. Those heavy guitars almost re-surface on Stanley’s Magic Touch – then run and hide as the Bat-Demon comes out to play… [Thunder growls, the Earth shudders] Ah yes, the doctor of love will tip the scales back to heavy… however… though Gene Simmons’s costume had reached ridiculous heavy metal proportions for this album (Gwar called and told him to dial it down to a 7), the guitars on his mere two tracks, Charisma and X-Ray Eyes, are folded neatly under the sugary vocals and boppy bass. And some smarmy keyboards way back in the mix that were slowly stealing KISS’s soul. 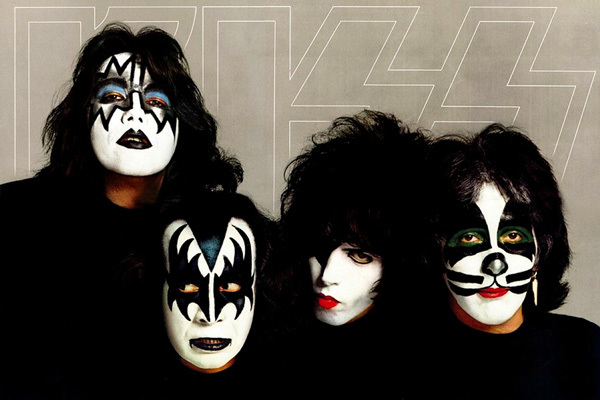 Poster Insert: This original photo showed the band in white straitjackets; it was doctored to look like black t-shirts when the record company thought it was too harsh a visual for KISS’s young audience. And though he was allowed to bitchslap that Les Paul in 2,000 Man, Frehley’s other two offerings are mere shadows of that belting, Hard Times and Save Your Love – the latter including an uninspiring solo, which for the Space Ace, is quite uncharacteristic. 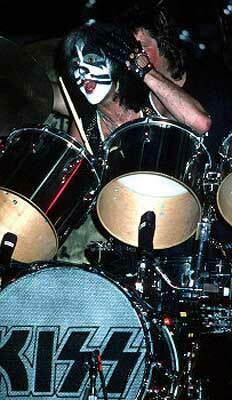 Anton Fig was hired as session drummer (recently on Ace Frehley’s 1978 Solo album). At the time, Stanley and Simmons had no intention of firing Peter and wanted to keep the band intact. It was Peter’s growing psychosis (what other word is there for someone who is given every opportunity and actively blows it?) that lost him the job in the biggest band in the world and toppled a dynasty. Released: May 1979, Casablanca Records. Vini Poncia, Desmond Child, Mick Jagger, Keith Richards, Stan Penridge, Howard Marks. by Jon Dunmore © 28 Oct 2015.